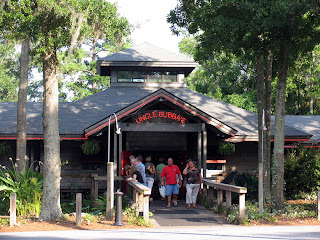 On the way to Tybee island, which is just outside of Savannah, you will come across Uncle Bubba's restaurant. Uncle Bubba is the brother of Paula Deen, who is probably Savannah's biggest export. She owns the restaurant, Lady and Sons in downtown Savannah, and sells cookbooks, food items, and has her own tv show on the food network. If you haven't heard of Paula Deen, you just haven't been paying attention. Just like Paula, Uncle Bubba's specialities are southern fare but with emphasis on the seafood. The restaurant is quite casual with indoor and outdoor seating but because this was Georgia in the middle of summer, most of the customers opted for the luxury of air conditioning. As seems to be the norm in southern restaurants, the service was friendly and attentive. In fact, Uncle Bubba himself came over to all the tables and said hello. How many owners of restaurants do that? For starters, they served warm cornbread with honey whipped butter. I was never a fan of cornbread but down in these parts they do it right, damnit. The sweet butter melting over the golden yellow bread ... yum. For the main course, I chose the flounder stuffed with blue crab accompanied by coleslaw and red savannah rice. Delicious and not too expensive for about $20. Part of the reason why I love the south so much is the food and Uncle Bubba gave me a real treat. Thanks Bubba! I'll be back.